How do you handle it when you hire an expert to do work for you and it seems they are doing a crappy job? When you’re not an expert, it is hard to know whether you trust them or your gut. What do you do? Here’s how I handled this when getting the exterior of my house painted. It’s mid-November in the midwest, which means it’s cold and yucky out and we’re in the middle of getting the exterior of our house painted. You’d think we would be done with getting our house painted, right? Well, I thought so too. We’ve been at this for nearly two months. I hired a painting company to paint my house because I don’t know a lot about exterior painting, and frankly don’t want to do the work involved! I hired a company that promised to do a quality paint job and replace rotten boards as they were discovered. To my surprise, instead of replacing the rotten boards, they painted over them! I’m no expert; however, that felt wrong to me. At first I thought well, maybe they replaced the boards? But our outdoor camera showed they clearly did not. When I got home that day, I touched the boards and sure enough, even with paint on them they were soft like a marshmallow. That can’t be good right? Lightly pressing on the board cracked the paint and my finger went right through. So, I emailed the owner of the company and asked what the plan was with the rotten boards. I told him the boards were painted over. The next day they replaced five of the boards. I was happy to see this was done but worried that they did not replace the fifteen or so other rotten boards in the same area. I gave them the benefit of the doubt until I noticed they put the trim up over the rotten boards. Apparently they felt they fixed everything. At this point, I was getting pretty irritated. Clearly they were cutting corners. I totally understand they wanted to get the job done. It’s cold out and they’re running out of time to complete the job. I contacted the owner again and expressed my concerns and asked him if he would like me to place a sticker on each of the boards that need replacing. At this point I also quoted his website, which clearly stated any rotten boards would be replaced. I told him that I contacted my own expert to find out whether it was okay to paint over rotten boards and told the owner what that expert told me. He agreed I should put up the stickers on the boards. So I did. And they replaced them. Soon after that was done the painting was considered finished and the owner came for a final walk through. I showed him other things that were either sloppy or missed altogether. Although I won’t go into it all, there was one thing in particular that was problematic and that was the porch. We had the front porch stained. It turned out pretty awful. Clearly it was a case of sloppy, half-assed, rushed work. When I showed the owner the porch and how sloppy it was, he said “well, you picked a semi-transparent stain and that is how that looks.” What?!? If that was how semi-transparent stain looks, then no one would use semi-transparent stain. Seriously. Do you see what he did there? He blamed me for the problem, stating I picked the wrong thing. Not only that but he told me this was normal. He was likely banking on the fact that I am not an expert in his field and that I would accept what he said. Unfortunately for him I am really good friends with Google and learned a lot about painting through this process. When picking the stain I also talked with the Sherwin Williams dude about what preparation would need to be done to use a semi transparent stain. So I knew what wasn’t done. When you’re unsure about your knowledge of something it’s hard to stand up for yourself, especially when dealing with experts. But I trusted my gut in this situation and knew that I needed to stand up for myself, otherwise I would be paying a lot of money for something that would need to be redone. I educated myself as much as I could so I was able to display knowledge about the process and show I knew what was missing. 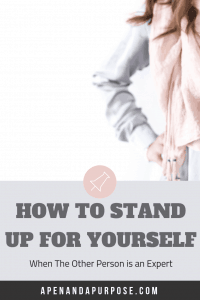 Although it is difficult to stand up for yourself in situations like this, it is important to bite the bullet and do it. Check out my post on challenging your thoughts so you can reach your goals, which may help prepare you to stick up for yourself. Learning this trick to face your fears before doing hard things will also prepare you. Before hiring the experts I made sure I knew enough about the process and what was needed so that I could make an informed decision about who I hired and why. I did a bit of research about exterior painting and what needed to be done for a good job. I researched the companies I was choosing between and picked one that showed an understanding of the steps needed to accomplish the job. I asked questions and made sure I was clear on what was offered. (In this case the website for the company makes some promises I was able to use when requesting fixes). Make sure you ask questions and get things in writing if they are important to you. When I noticed they were not doing something, I quickly asked about it in a non-accusatory way. I said I noticed the painters painted over some rotted boards and I was curious what the plan was. This allowed the other person to look into it from a non-defensive place. His response was to fix some of the boards. When the boards were not all fixed, I brought it up again and offered to help. I provided an outside expert opinion on why the boards needed to be replaced and stated I would mark the boards that needed to be replaced if that would help. At this point I knew the owner could easily become defensive or see me as challenging his expertise; however, my goal was to show that I am not going to back down on the issue and that I actually understood this was a problem that needed to be fixed. I updated him after things were fixed and thanked him for taking care of those issues. I made sure I kept the relationship with the owner positive (even though sometimes I wanted to yell haha), because that is the person I need to work with. Sticking with the facts rather than putting judgments and accusations in there can help because the person can’t argue with facts. So instead of saying “it is a sloppy, rushed job that even a kindergartner could do” I described that there appeared to be areas where the stain was poured out and allowed to dry in pools and that it appears the porch may not have been treated prior to being stained because of this area and that area.After some of this was fixed, I thanked him for that and took pictures of the other areas that were missed and sent them in an email. This is not over yet since they have not fixed the things and I have not yet paid. I will continue to stand up for myself since painting is a lot of money and I don’t think it is right that they took so many shortcuts. Although it is hard and scary sometimes to stand up for what you need to, it is worth it because in the end you’ll get things fixed. If you don’t then you have other decisions to make including pursuing legal avenues. In my experience, being reasonable in these situations, keeping emotions out of it as much as possible, and showing you are knowledgeable enough to know what you are talking about helps to remedy the situation. My hope is this experience will help you to stand up for yourself when you run into a similar situation where someone has expertise or power and it’s easy to back down thinking they know better. Although it would be great if everyone used their knowledge for good, there are times when your lack of knowledge about a topic could be used against you (i.e., semi-transparent paint is supposed to look terrible haha). Go ahead and pin this to Pinterest so you can come back to it later when you are hiring an expert to do something you don’t know well and feel there is something. Hopefully the steps I took can also help you.